A little piece of paradise located on Lake Keowee and just a short drive from Clemson, Greenville and surrounding cities! This 4 bedroom/3 bath home is located in the gated community of Harbour Pointe. On the main level you will find the great room with stone fireplace with gas logs, the kitchen with granite eat in island, two bedrooms with Queen beds,a full bath and the laundry with stackable washer and dryer. The open floorplan is perfect for entertaining with gorgeous views of the lake from most rooms. The loft area features a bedroom with two double beds and a full bath and is the ideal place to wake up each morning and look out over the lake. On the lower level, there is a bedroom with a double bed and bunk beds and the third full bath. (The lower level bedroom does not have a window.) The bonus room in the basement is the perfect place to just hang out by the fireplace, watch tv, play games, etc. There is a storage area in the basement with shelves, a second refrigerator and plenty of space to store life jackets, etc. 146 Harbour Pointe has a spacious deck, bigger than most in the community, and a large screened porch. 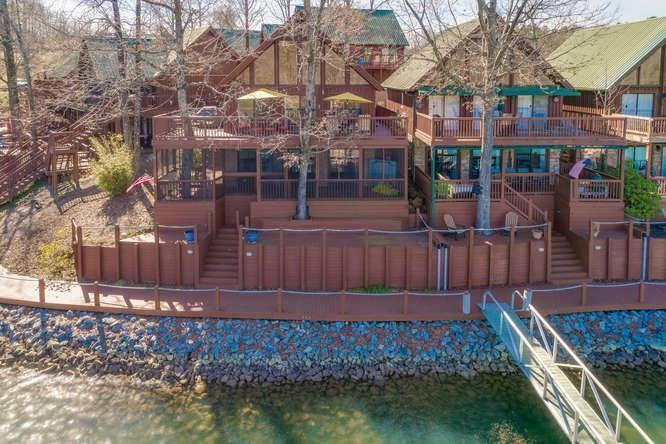 The home is just steps to the boat dock with a deeded slip (1st one on the right.) You will love walking thru the community on the boardwalk along the lake! HOA dues include one boat slip, water and landscaping in common areas. Most furnishings will convey with the exception of personal items and some family pieces of furniture. Harbour Pointe is a great little getaway from the hub bub of life!